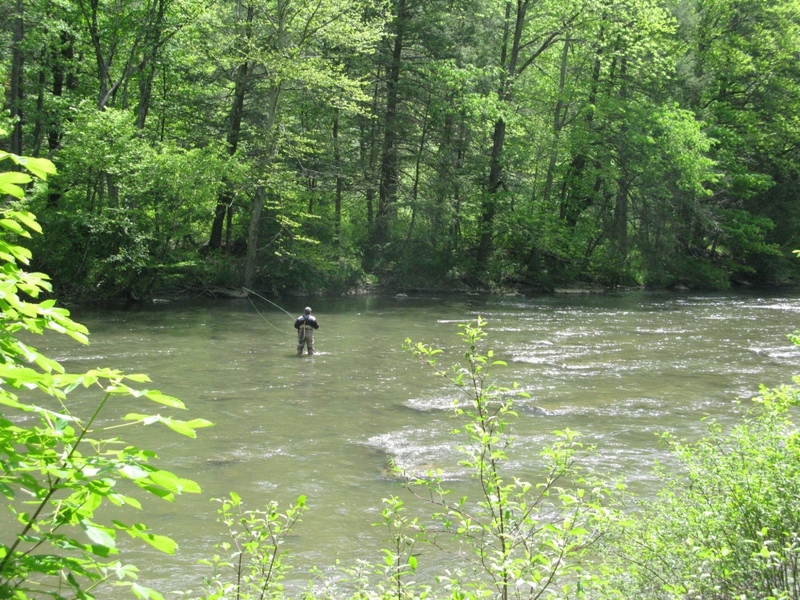 Through my friend and fellow fly tier, Eric Austin, of Delaware, Ohio, I was invited to join him and a group of other anglers for a few days of fishing Penn’s Creek while staying at a private cabin near Weikert over Memorial Day weekend. We hoped to see some green drakes, and as things turned out, we did. The first evening we fished the Cherry Run Pool, and afterwards we were guests for dinner at a cabin on the pool. Dessert that night was homemade blueberry and pecan pie that I had baked that afternoon. Kept in a wooden pie-saver, they were actually still a tad warm when we served them after dinner. I did not know it beforehand but pecan pie is Eric’s favorite. Incidentally, Eric is one of the contributing tiers for my upcoming book, Favorite Fishing Flies – 1892. There were Great Red Spinners in the air, a few sulphurs about, plus some caddis and a few Blue-wing Olives. Our fishing start time was delayed by a passing thunderstorm, so we did not actually get on the water until after 7:30 PM. I took one sixteen brown on my March Brown Sexi-Floss Spinner, size #10, hooked and lost another decent fish, and rose a few more. Most of the other fellows took some trout as well. 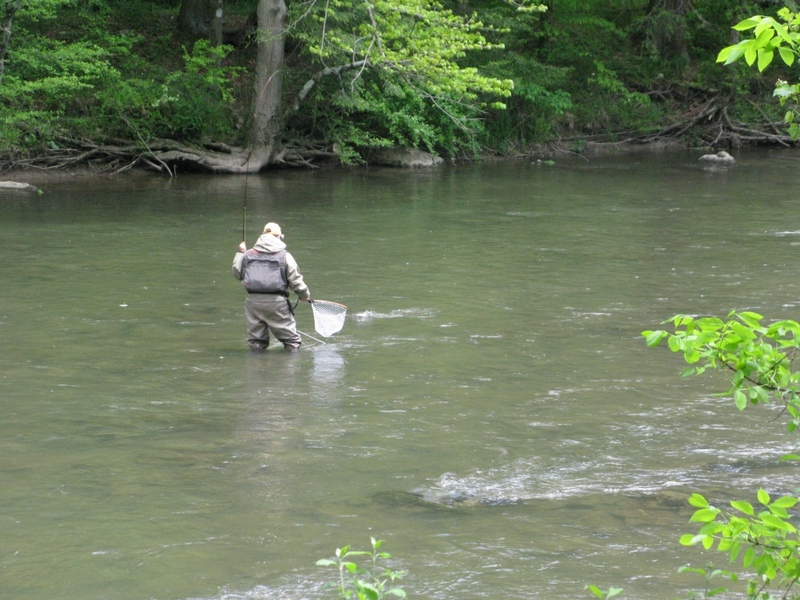 On Friday we all traveled over to Bellefonte and fished on Spring Creek. We had sulphurs hatching there and everyone had a good day, mostly taking trout on drys. I was using my tandem Sulphur Dun and Floating Sulphur Emerger that day, which I had written about in a separate post on the success of that tandem rig during five previous trips to Spring Creek this May. Friday evening saw us back at the Cherry Run Pool on Penn’s Creek, and upon our arrival there, on the water floated the greatest number of March Brown duns I have ever seen anywhere in my life. The air temperature was quite cool, it was drizzling a little, and the duns drifted and fluttered helplessly on the surface, many of them unable to get airborne due to the cold temperatures and drizzle. Along the entire several hundred yard length of the pool, fish were up. The six of us stretched out along the pool. I was using my BXB March Brown Extended Body Dun, and caught some fish just by standing on shore and casting to rises near the bank. All six of us took some fish; at the end of the evening I had three smallmouth bass, two chubs, and two brook trout, which were actually both of decent size. The following photos are nearly all from Saturday, when we traveled to Coburn, Pennsylvania, stopped at The Feathered Hook Fly Shop, and then drove downstream a short distance to fish. We parked along the road and basically fished an adjacent short section of the creek. A couple trout were rising already at eleven AM. Bruce got into position and hooked and lost one, then Eric Austin took Bruce’s place when he moved. Eric worked several rising trout under some overhanging tree limbs. He rose a few of them, but did not connect. 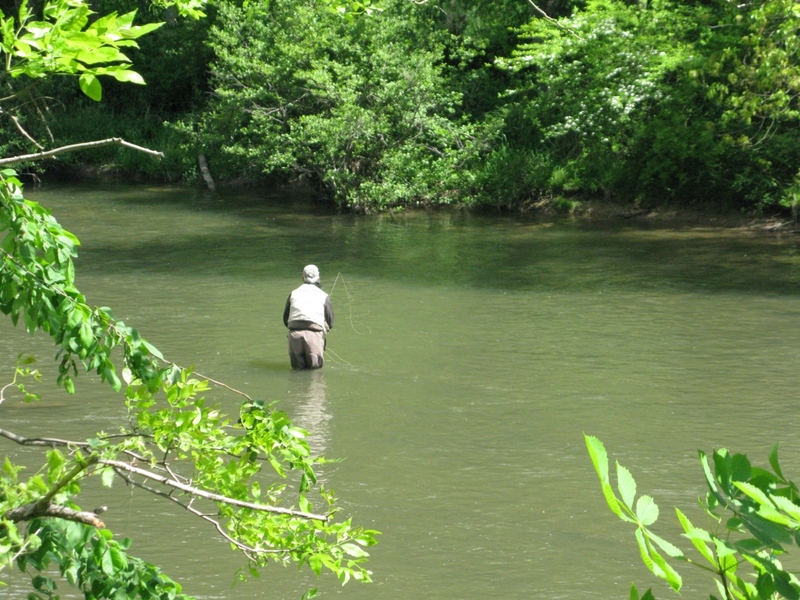 Eric then moved downstream where he took a nice trout. Bruce caught one near where Eric had been fishing. Our host and camp owner, Tom Wilson, had a few things to take care of, plus he had heard that the green drakes started well downstream the day prior, and he wanted to certify that with the possibility that we might fish that hatch in the evening. Me, I took my time and decided to have lunch before I started to fish. I walked Abigail a little bit, got out a lawn chair, ate my sandwich, had a beer, relaxed and watched the water and my companions. When I did get in the water, it was upstream from the rest of the guys. I saw sporadic rises, rose a few fish, but it was tough. I failed to connect with anything. At that point, as I was sitting on a mid-stream rock, around 2:30 PM I saw a green drake dun. Then another, and another. Before I left that spot, as I was just sitting on a midstream rock, watching the water, I counted eleven green drakes duns. There were sulphurs hatching on the increase, some caddis and a few other bugs, but still nothing other than the odd single rise here and there. When I did cover a rise with a sulphur dun it was to no avail. I finally walked back to my car, pulled out the lawn chair, grabbed a beer and sat and watched the rest of the guys fish. We saw a few more green drakes taking to the air, counting a total of twenty-three in addition to those I had already seen. By now Eric and Bruce had taken five nice trout. 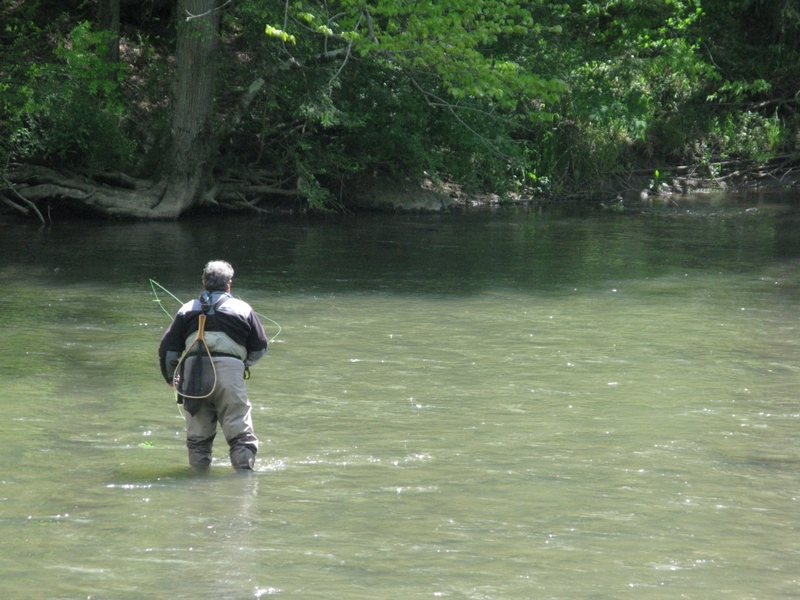 Bob had settled into position where Eric started, casting to three or four rising trout – the same fish that had been rising for about five hours – and for over three hours, he had a couple rises but did not connect. About 3:45 Tom returned, and came over to chat with me. He said the drakes were definitely on below Weikert. We then watched Bob casting to those rising trout. Tom said, “He’ll never catch any of those fish, he’s getting too much drag.” And then he turned and walked over to talk to Eric and the other fellows, who had all returned to the cars within a few minutes. I kept watching Bob, and no sooner had Tom walked away, when Bob set the hook and had a bend in his rod. “Fish on!” I exclaimed. I got up quick and grabbed my camera. 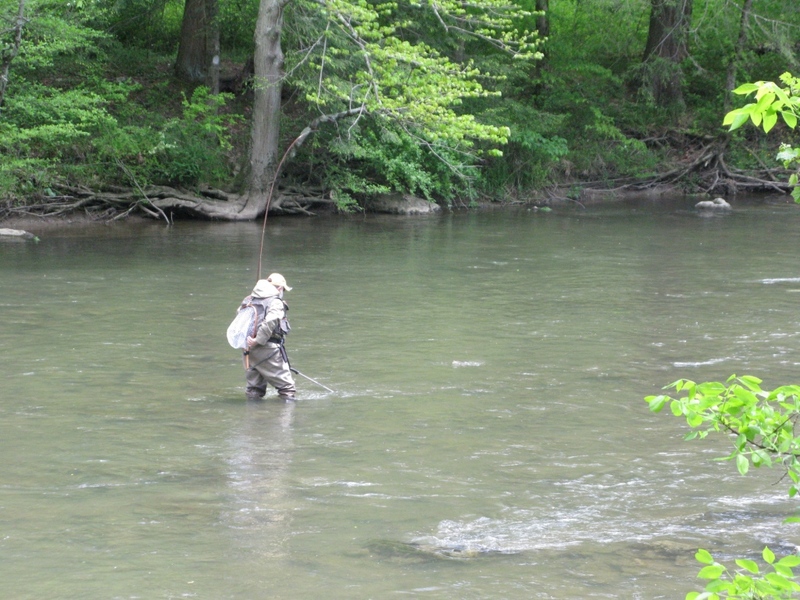 Eric Austin, working several rising trout in Penn’s Creek below Coburn under the trees. 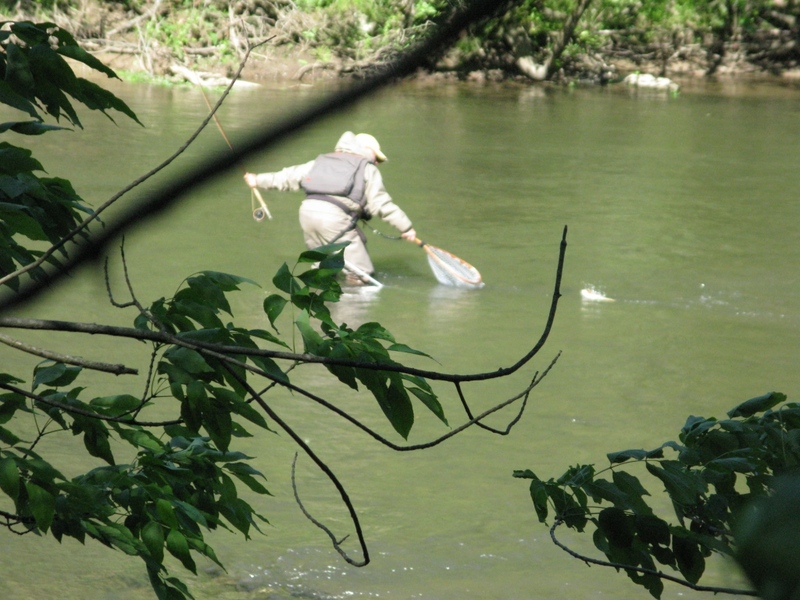 Eric is still casting to those fish…note the nice upstream mend in his line. 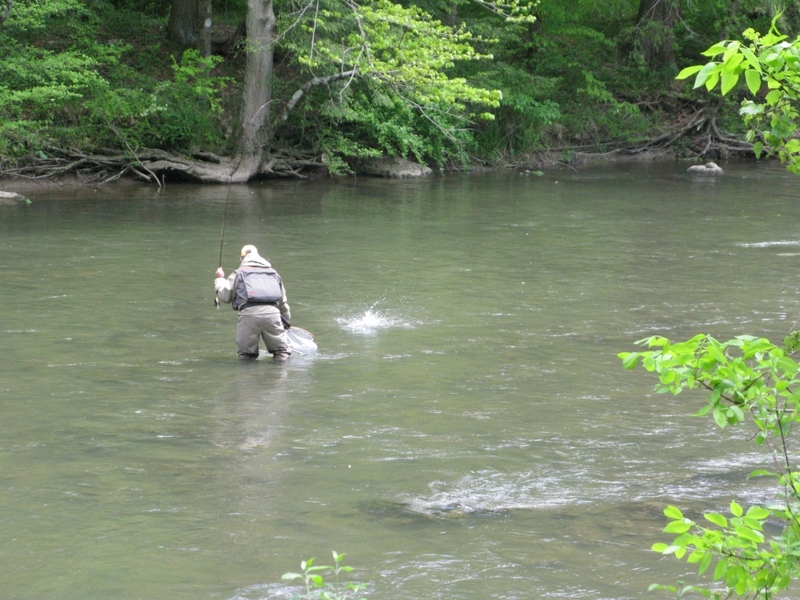 Bruce covers a rising Penn’s Creek trout. 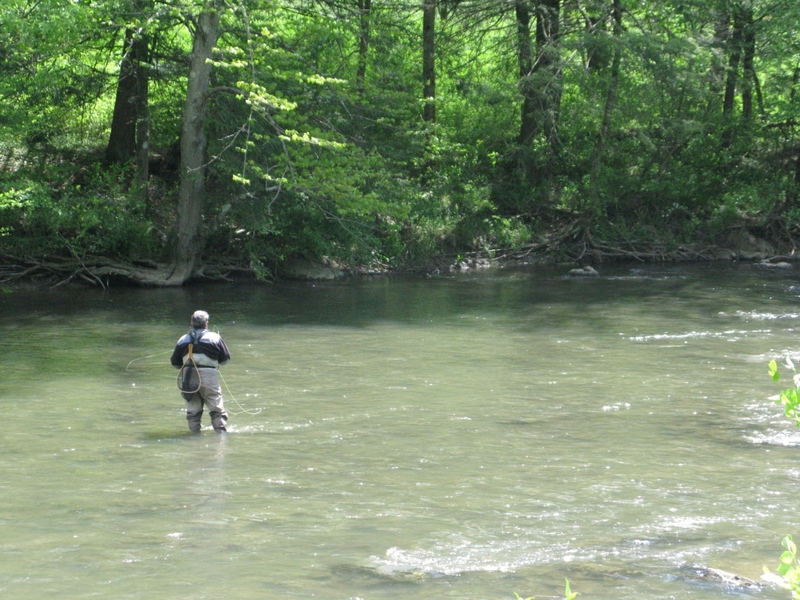 Eric moved downstream, where he later connected with three nice browns. Bob brings the trout in closer. Bob works the trout closer to the net. The fish is not ready to give up. Bob eventually led the trout to the net. Bob netted this trout, and from my location, I estimated its size at nineteen inches. 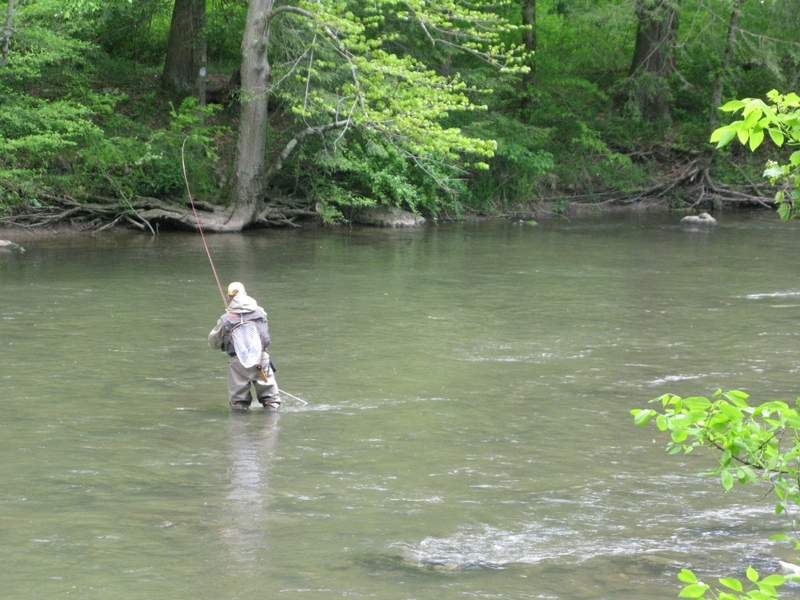 This was the sixth trout taken that day, by him, Bruce, and Eric, all on various sulhur dun patterns, ranging in size between 16″ and 19″, in just a 125-yard section of Penn’s Creek. This was in the Trophy Trout Section, and these fish were all of legal harvesting size. Eric took three of the trout on the Swisher-Richards No-Hackle Dun, a favorite pattern of his. Bruce had two, and Bob, just one but it was the best fish of the day. Penn’s Creek, May 25th, near Weikert. Each light greenish-yellow spot on the water is a green drake dun. This is in an open water section with no special regulations. 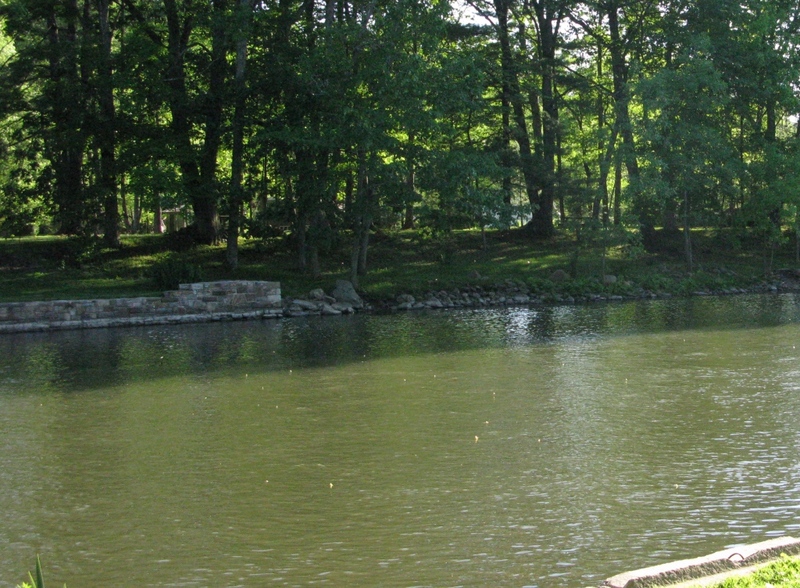 A zoomed-in image of the same section, this shot provides a better view of the green drake duns on the water. A cabin neighbor of Tom’s, Ed Torchia, was fishing here. He took a nice smallmouth bass that was rising. Bruce, in our group, landed a bass about 17″. Fish were up in this entire section. I tied on one of my BXB Green Drake Thorax Duns and went below the dam to the tailout and landed the only trout I saw rising, the fattest ten-inch brown I’ve ever seen in my life. I guessed if that fish had been eighteen inches he would have weighed four pounds. Most of the fellows took some trout. The highlight of the evening for me was an 18″ brown that I saw rising, and he took the Green Drake dun on the second or third cast. That fish got off just as I was netting it, so there is no photo of my story. You’ll just have to trust me, but I have a witness, Tom saw me playing the fish and got a look at it as it flopped over the rim of my net. I later hooked and then lost another trout of about the same size. The real delight of the evening was that of the six anglers in our group, four – Eric, Bruce, Bob, and Dean, had never seen a green drake hatch in their life. It was pretty spectacular. 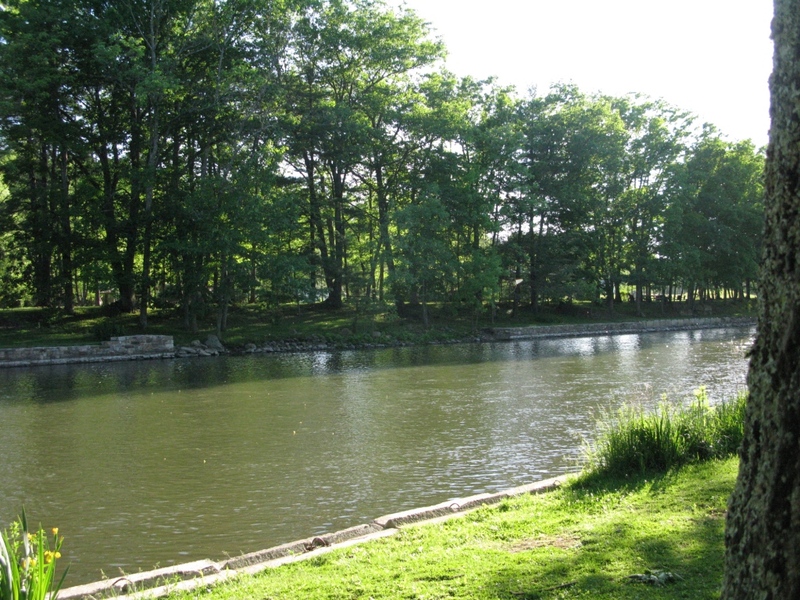 Ed stopped by Tom’s cabin later in the evening and said that this pool, from 2:30 to 3:30 PM that afternoon, produced the largest hatch of green drake duns he had ever witnessed, and he’s spent years on Penn’s Creek during the drake hatch. In all it was a great weekend. New friendships were made, fellowship shared, fish were caught, cigars were smoked, beverages quaffed, fish stories were told, and plans were made to do it again next year. Thank you to my friend Eric for the invitation, and thanks to Tom Wilson for hosting us at his camp.